I have been training for this 5oK for 3 1/2 months and nothing could have prepared me for this amazing yet difficult adventure. So, here goes my race report before I forget everything both good and bad that happened during my 9:45 minutes of trail race. I didn’t take any pictures during my race, only before and after so you’ll just have to visualize my race. This is the starting chute 6:00AM in the morning in the Marin Headlands. It was starting to get real. I was feeling good, had a great night sleep and a warm breakfast and some coffee and was ready to hit those trails, the same trails I had been running for months now. I got into the chute but kept to the back of the pack because I tend to get caught up in the excitement and start off too fast. This time I knew it was going to be a long haul and wanted to pace myself. And I am off, up the slight incline from the hostel area and out to the hills of Marin and Mt. Tamalpais. I felt great going up Miwok, felt the strength of my arms propelling me up. I was so happy, it felt like I was floating up what used to be my “nemesis”. I felt strong and not tired at all. I got to Old Springs Trail and just flew down; it’s one of my favorite parts of the course. It’s so lovely and beautiful, I just ran and took it all in. By the time I got to Tennessee Valley for the 1st time it was mile 5 and I was 1/2 hour ahead of my time that I predicted to get there. I said Hi to one of my coaches who was there volunteering, got a hug, ate a few chips, a drink of water and kept on moving. I didn’t need to stay at that aid station for too long, it must have been less than 1 minute. I hiked up Coastal which is no big feat, but again I was using my arms to get me up and it seemed like I got to the top before I knew it and was getting ready to go down to Pirate’s cove feeling strong. Here is a picture of me at the top of Coastal. I got down Pirate’s Cove without incident and then back up to Coastal again pretty quickly. I was feeling quite good. Keeping ahead of my times that I had set out for myself. 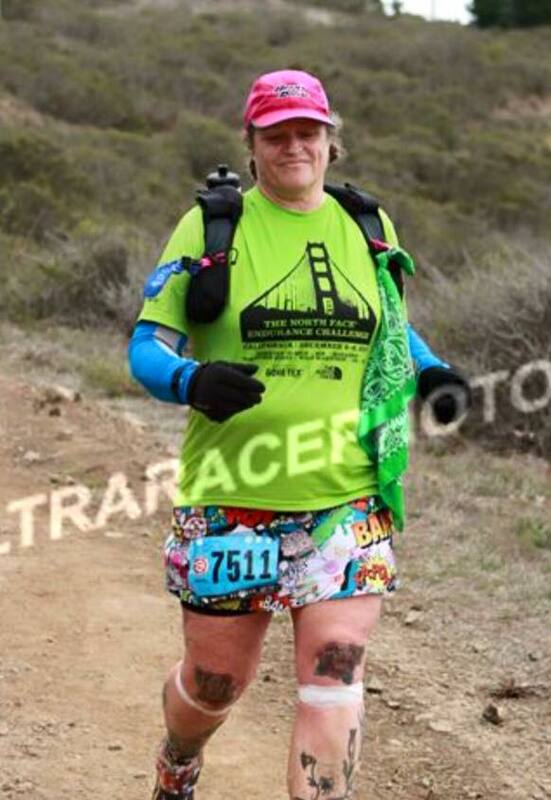 I saw another friend at Muir Beach aid station, filled up my water bottle and the bottle with my electrolytes. She was kind enough to do all that for me while I ate some cut up bananas, hot veggie broth and BP&J squares. I hate the crusts so it was pretty much one bite sandwiches. I was at the 2nd aid station for about 3 minutes, mile 8. I still felt really good and wanted to keep moving. Next stop – Heather Cut Off. Running along the road to get to the next trail section is a bit nerve-wracking as it is a live road and there are cars and tour busses zooming along. There were signs for runners but not everyone cares or slows down. About another 1.1 miles and I am at the bottom of Heather cut off. I am still feeling great, strong and know that my next aid station is at the top of Cardiac. I know my friend Pen and Amer will be there and I could make it. I was able to run the flat areas and climb on the uphill. I got up to the top of Cardiac in 3 hours which was totally amazing for me. I was way ahead of schedule and I still felt strong, healthy and was staying on the top of my hydration and food. Eat / Drink early and often my coach always says and all those training runs really paid off. I just ran 3.8 miles from the bottom of heather cut off to Dipsea is which is 1,659 ft of elevation at a 6.4% grade in 1:11:42, I am feeling so happy with my time! So now I am off down Muir Woods and the Dipsea Trail to the hardest part of the course for me. I had reason to be worried because over the past 6 weeks I had fallen 4 times around similar places on that trail. I put my running gloves on just in case I fell and I took it a bit easy, I knew that I was ahead of schedule; I wanted to keep running downhill and pick up some extra time but didn’t want to fall and get hurt and potentially pulled off the course. So down I went and kept going down and up until I came to the Lost Trail. OMG – the Lost Trail. It’s .7 miles straight up (745 ft with a 15.1% incline grade) with stairs that aren’t even, it’s like doing squats the whole way up, and it only took me 24:54 which was my fastest time. It’s tough and without doubt the most difficult part of the course for me. I got to the top feeling really good still. My legs weren’t wobbly in the slightest and I knew I had this. It was a great feeling. I was on my way to The Sun Trail which was a rocky but a gently decline and from there I would run more of the Dipsea Stairs and into Muir Woods. I was feeling great! Then it happened — about mile 20 or so, my IT bands in both legs/knees started acting up and started causing some pain. It wasn’t too bad so I stopped and did some stretching and it felt much better. I got down to the next step of the Dipsea stairs and every step was excruciating. I had to go down the stair sideways because running down or walking down the stairs was not going to happen, I didn’t know what to do but keep moving forward. I finally got to the next aid station at Muir Woods and asked for some tape for my knees. I thought if I taped up my knees it would relieve some of the IT band issues I was having. I filled up my water bottle and electrolytes up too along with some PB&J and coke. I didn’t want to have any coke or soda until I was at least I was 1/2 way through the race to help me finish strong, this was more than 1/2 way so I felt great about having coke now. I crossed through Muir Woods and was able to run up the next set of Dipsea Stairs. I was able to run up the hills as my knees weren’t bothering me on the uphill it was just all the down hills and some of the flats if they were angled downward. Running from Muir Woods back to Muir Beach is fairly flat so I felt like it would be fine to keep running. I got back to Muir Beach and had to sit down because my knees were not cooperating. My friends Paulina and Josephine were so great; helping me this last stretch of the way back up Coastal Fire Road to Fox Trail. I was still in pain but going up didn’t seem to bad, but I was still going slowly because of my knees. This was the 2nd to last climb and I wasn’t going to give up. It took me 41:18 to climb 1.5 miles (900 ft with a 10.5% grade) and boy oh boy could I feel it. I got to the top of Fox Trail and my friends Paulina and Josephine took off down the hill and I had to walk down, my knees were screaming. It felt like I was taking baby steps and thought it had taken me 40 minutes to get down but after analyzing my run I see that it only took me 24 minutes. That was the longest 24 minutes of my life. I wanted to quit, I didn’t think I could go on any longer. I knew I only had 6 miles left but I didn’t think I could make the cut off and honestly I didn’t care at that point. I was in so much pain, I was crying all the way down Fox Trail. I got back to Tennessee Valley and saw my friends Christine and Laura; they both gave me hugs and told me how awesome I was doing. I told them I was afraid I was going to get swept off the course and they told me that I still had almost 1 1/2 hours to finish. They gave me the determination I needed to keep on going. More coke, a quick trip to the port-o-potty and I was off up Marincello for my last climb of the race. Like I said earlier, going up was easier for me then down or flats. So, for the first time in my life I was RUNNING UP MARINCELLO. It was exhilarating! To put this into perspective; it is 2 miles uphill non-stop and I was running it. I got up to Alta which is the last aid station and had almost caught up to my friends which felt amazing. Even with all this pain I was pushing forward. Now came the last part of the course. It was all down hill and I was so scared I was going to need to walk it but luckily I saw a way down so I didn’t have to bend my right knee. There were peaks and valleys in the road so I kept my left foot on the high ground and my right foot on the low spots so I could sort of just swing my right leg down the 2.5 miles and actually run. The thing is that I wasn’t tired, my legs weren’t tired I physically felt great because I hadn’t actually been doing that much running since mile 20; only 2 miles up Marincello and these 2.5 miles down near the finish. I got to the bottom of the hill and realized I only had less than 1 mile to the finish line. Most of it was flat with a slight incline at the end. I wasn’t going to quit! I wasn’t going to stop until I crossed that finish line. My “C” goal was to finish under the 10 hours and if I could I was going to make that cut off. With about .4 miles left to go I saw my partner Lynn, seeing her was the best thing in the whole world to me. She ran about .1 of a mile with me while I cried and thanked her for being at that spot for me. If she could have been anywhere along the course — THAT is where I would have wanted her to be. It was absolutely perfect! I found the strength inside of me to keep running back up that last small incline to the finish line….and I am happy to report….. I crossed the finish line with 15 minutes to spare! Even though that was my 2nd 50K it was by far the most difficult, not because of the knee pain but because of the cold weather, the elevation gain and the difficult terrain. I am going to do this race again next year with the intention of a PR – no IT band/knee issues and will be stronger than ever! I have the best friends, coach and running buddies in the whole world. 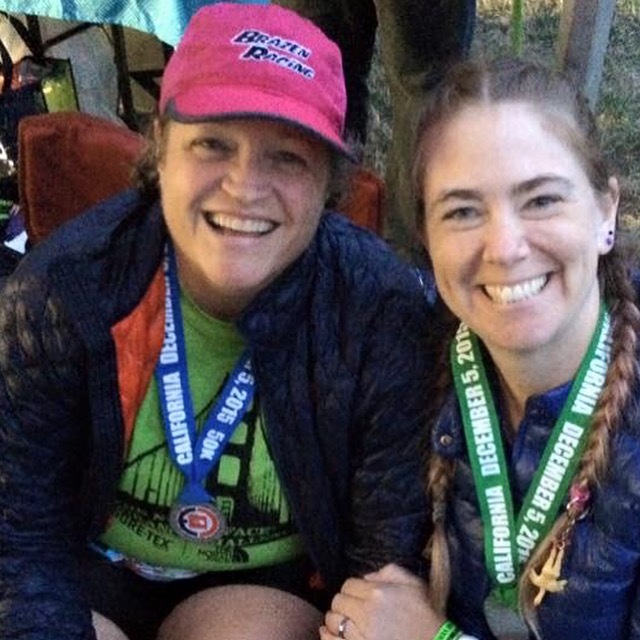 Completing my First Ultra Marathon ——- 50K in the Books! It has been my goal since I started running almost 2 years ago to become more fit and strong. I never thought in my wildest dreams that I would ever complete a marathon, let alone an ultra marathon. 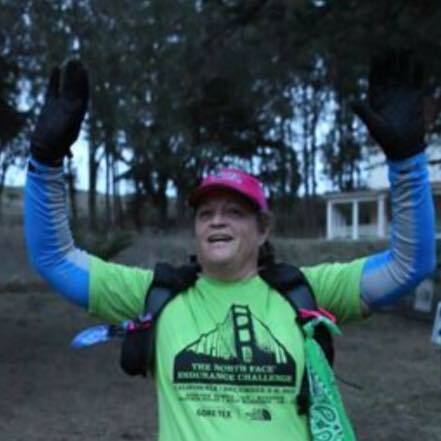 In August of 2013 I joined The SF Marathon Training Group or Run365 as it is affectionately known. I knew immediately that this group was for me. They gave me such a well-rounded approach to running. Being a complete beginner over the age of 50 I needed a lot of extra coaching and support. I needed help with not only how to increase mileage, but the best way to fuel, how to make sure you are hydrating correctly, how to stretch before and after a run plus much more. What I didn’t realize is that once I started running I didn’t want to stop. I mean I NEVER want to stop running ever. I love it, I really and truly love it. I feel more like myself when I am running, especially when I am running on the amazing trails of Northern California. 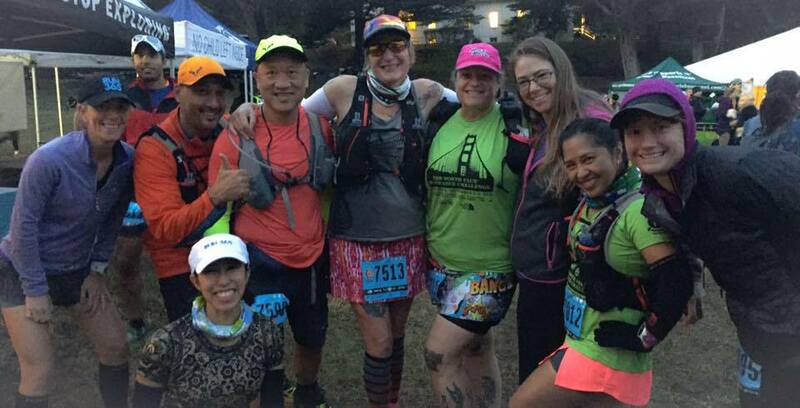 1 month after I started running, one of my coaches told me about Brazen Racing and how wonderful they are and what an amazing job they do putting on trail races. 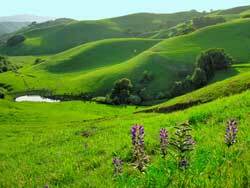 My first 5K trail race was Bear Creek at Briones Regional Park. It was so wonderful, I felt great and was so proud of my accomplishment. This year, I will be running the Bear Creek HALF – I am so excited! I have attached the map and elevation chart for you just in case you would like to have a peek. So, now to my major accomplishment! 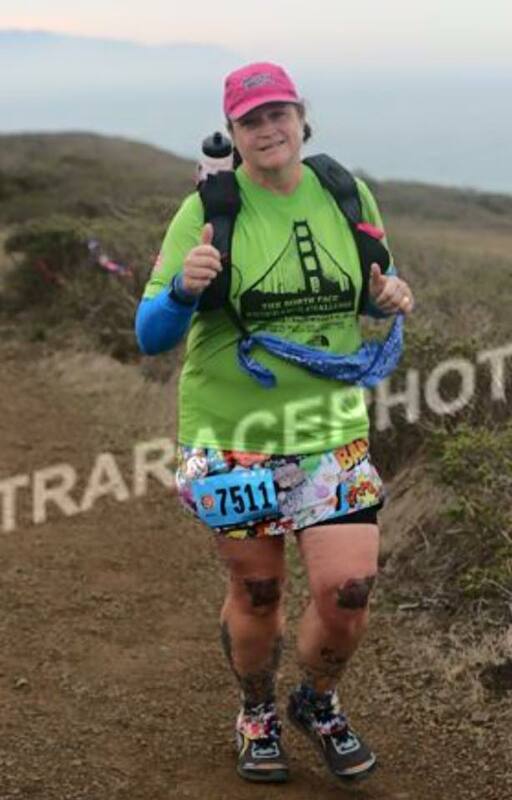 Starting and completing my first 50K. 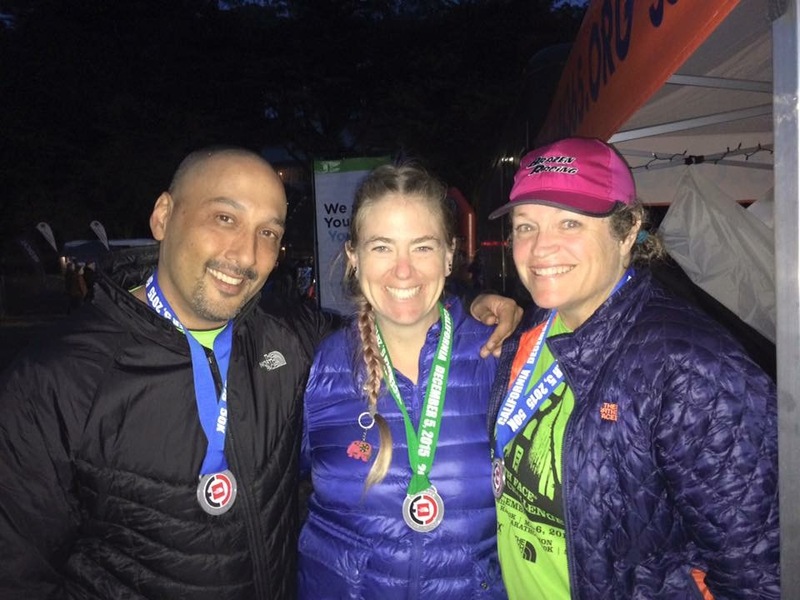 I set a goal for myself to run Brazen Racing’s Dirty Dozen 12 hour race and to complete a 50K in 10 hours or less. If I could do this then I would sign up for the North Face Endurance Challenge, which take place in the Marin Headlands at the beginning of December. Not only did I complete the 50K, I did it in 8:37 minutes. 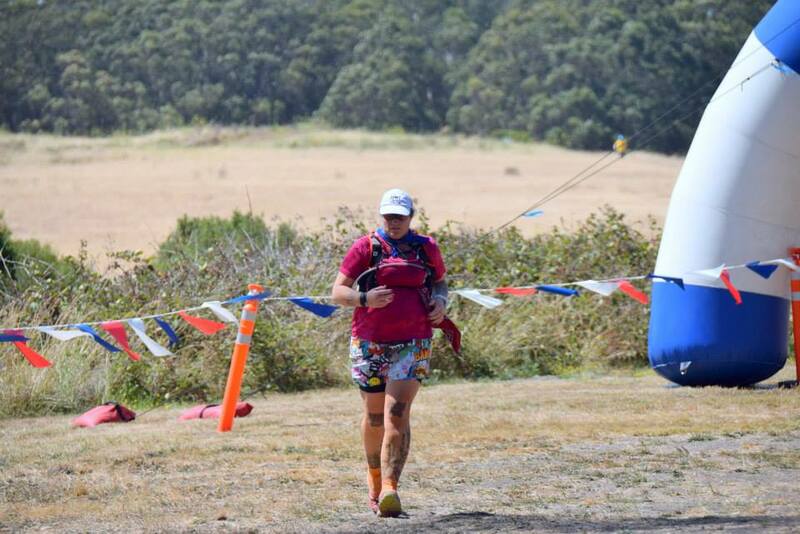 I know by Ultra Marathon standards – the time isn’t that impressive but for me it was outstanding. Not only did I run 33.7 miles which is more than a 50K (31.07 miles) but I did it under my goal time by an hour and 1/2. I am so proud of what I’ve done and in the time I’ve done it. If anyone that reads this, is over 50, has never run before and thinks they can’t do an ultra marathon – I am here to prove otherwise! Anyone can do anything if you put your mind to it! Be smart about it though, use all the resources you can; read any and all books and videos. Find a good running group or a running coach and just start. That is the hardest part, starting. Maybe you’ll be like me, once you start you just won’t want to stop! Below is a picture of me crossing the finish line of my first 50K!